GIF Finder creator Matt Cheetham today announced that his popular GIF curating app will be pulled from the App Store following a lengthy back-and-forth with Apple (via iPhone Hacks). Cheetham faced stonewalling from the company thanks mostly to a few copyright issues of Disney-related characters within the app. Begun by Cheetham as a side project a few summers ago, the app used Tumblr and Imgur's APIs to discover and curate a collection of GIFs and images and distill them into categories or as search results for users to browse. It launched in 2012 and had nearly 90,000 downloads in the years since. A recent update caused the app to crash on the iPad version when sharing a GIF, so Cheetham submitted an update to fix the issue. Instead of the usual okay from Apple, on January 25 he received a rejection notice for the update because the app "includes content or features that resemble various well-known, third-party marks, including Disney characters." Thank you for your response. However, in order to proceed with your application, we require documentation demonstrating your right to use the images included in your app and/or metadata, specifically addressing your right to copyrighted images. Otherwise, if you believe you can make the necessary changes to your application and/or metadata so that it does not infringe the rights of a third party, we encourage you to resubmit your revised application and/or metadata. Cheetham pointed out that he doesn't directly own the images and proceeded to offer copyright, disclaimers, and links to the Tumblr and Imgur terms of service, but he admitted it "all has fallen on deaf ears." He ultimately relented, pulling the crash-prone app from the storefront upon Apple's repeated requests for documentary evidence of his ownership of the content. At this point, I don't have the time or knowledge on how to fight this any further. I can't have an app in the store that I cannot support (and that crashes when attempting to use it's main function! ), so today I am removing GIF Finder from sale and calling the project dead. There's lots of other really great GIF Finding apps out there that are packed edge to edge with content from various API's. I wish them all the best with their next update and only hope they can continue to slip them in under the radar as I appear to have done for the last 3 years. Apple and Disney's history is well-known, especially Steve Jobs' hand in the now Disney-owned Pixar Animation Studios, but Apple's crackdown on GIF Finder is unusual. GIF Finder has been in the App Store for three years without rousing attention and there are several other similar GIF apps in the App Store. Apple has recently been enforcing App Store policies that it's been lenient about in the past, rejecting a number of apps that included screenshots of violence or guns, causing developers to modify the shots or remove the imagery all together before being able to update or release their apps at all. Update 10:00 AM PT: Cheetham announced, via the GIF Finder Twitter page, that he has submitted an appeal to the App Store review board and is scheduling a call with Apple to go through the results of the appeal. Update 11:04 AM PT: Cheetham now says his appeal has been heard and that GIF Finder will be returned to the App Store after he submits an update removing specific mentions of three image categories. Richard was extremely polite and helpful and I'm very grateful for the speed at which this has all progressed. I've been assured that if I resubmit after removing these categories that my app will be approved and I can get it back into the store. Cheetham also says he's been told any future rejections due to improper categories will include details on the issues rather than a simple form letter. If I was him, I'd try resubmitting with non-Disney GIFs in the screenshots and see if it would go through. 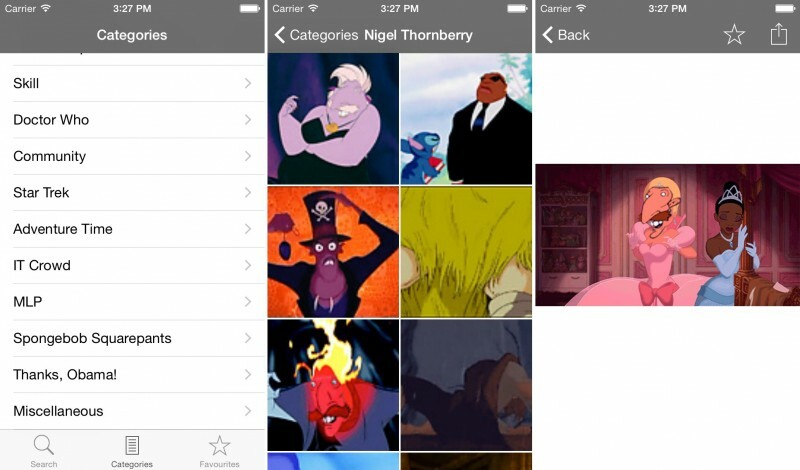 Just stop including screenshots with Disney owned images on it to the iTunes store. My biggest problem with Apple's App Store policies is how they simply don't follow their own rules. Example: Open Safari, go to google.com/images, and then type "Disney pictures". So why does Safari get a pass when this GIF Finder is essentially the same thing; a search engine for images. I suspect it's around the marketing of the app... the author has chosen several Disney characters to help sell this app, and yet those images have not been licensed from Disney. They may be freely available elsewhere, but that's not the point. It's how the author has chosen his marketing image. If I was Disney, and someone used my artwork to sell their app, but never shared the profits with me, I would be upset, as well. First, this is not parody in a legal sense. Second, "fair use" is a legal argument to overturn copyright infringement lawsuits, and as such is not an absolute. The author can make this argument to the individual rights-holders and attempt to get their permission for any such content, or the author can integrate a filter into their app which does a best attempt at filtering out all content which is contested as owned by others along with a mechanism for that filter to be expanded as further unlicensed content is found. I'm sorry, but the author of the app is completely in the wrong, and Apple allowing his app through could be construed as Apple being party to copyright infringement. Pointing to his source (imgur, etc) is not a defense; imgur may well be in the wrong too, but that isn't pertinent to the author's case nor to Apple's concern about being pulled in as codefendant. Imgur may in fact have a claim-and-removal system in place, but the results are obviously not sufficient to avoid copyright infringement by unfiltered use of its stream. Moreover, there is a way for such an app to exist. It just needs to effectively filter out copyrighted images, and provide a mechanism to continue filtering those out. This would be a substantial amount of work for the developer to undertake, but certainly not impossible. Apple must have some idiotic new employee with barely any knowledge or reasoning power approving these apps. Under this criteria, the Google, Bing, etc., apps should also be banned. Or maybe Apple is tired of getting sued and wants to keep the App Store free of copyright infringement. Or hire a graphic artist to create fake images for the screenshots that aren't public domain. Then post those screenshots in the store. A "starving" digital artist could be engaged pretty cheaply and all of the screenshot "art" would then be original or public domain. So the whole "Goodbye GIF Finder" was a knee-jerk reaction, without allowing sufficient opportunity for the entire process to be seen through. Well it seems that Apple has stepped up and done the right thing, and very quickly, too! This goes to show that we, as users of services provided by companies, need to keep our cool. Companies don't always make all of the best choices, and our feedback can contribute to their operations in a positive way. I recently contacted my bank to express my dissatisfaction with their mobile banking app and changes recently made to their website. In both cases, my feedback will be passed along to the appropriate departments for review. I could've just posted my complaints to the inter-web and stomped off in a huff, but I chose to contact "the company" directly. I received a favourable response that helped to retain my confidence in my relationship with that company. It's all about how we choose to respond. For Matt to say "Goodbye GIF Finder" was a short-sighted and premature response. He merely searches well known image services. So he actually doesn't have much control though he could try a rudimentary filter of some sort but that still doesn't make it 100%. I believe the point dejo was trying to make is that Apple might simply be objecting to his use of Disney characters in his screenshots. He can generate new screenshots that don't infringe upon Disney characters. However, at this point, it's probably too late, as this story will have gained traction and Apple will be unlikely to overturn this decision.